Elderly patients are being treated too aggressively for high blood pressure, researchers claim. 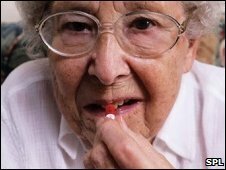 They say the "oldest olds", meaning patients aged 80 plus, are being given too many drugs and in too large doses, which may do them more harm than good. The Cochrane scientists who looked at the available data say doctors can set their targets lower for octogenarians. This makes good economic and clinical sense given the expanding elderly population, they told bmj.com. But doctors said high blood pressure is largely under-recognised and under-treated in the UK. Experts say the "oldest olds" are the fastest growing sector of the world's population. According to latest estimates, the UK population of 85-year-olds will go up by a third by 2020. And more than half of these will need treatment for high blood pressure, the British Medical Journal reports. Most sensible GPs - which most GPs are - take a pretty cautious view to doling out drugs to old people. UK and US guidelines recommend that people over 80 should receive the same blood pressure treatment as people of any other age. This means using combinations of drugs to reach a target blood pressure of 140/90 mmHg. But head of the Cochrane research group, Dr James Wright, says clinicians should change what they are presently doing and move towards a more conservative approach for the over 80s. "I have done so with my patients," he said. His review of existing studies, including data from two new trials which looked specifically at the effect of blood pressure drugs in this age group, found little evidence that aggressive treatment saves more lives. Although fewer patients died of strokes, the total number of deaths from all causes was unchanged. The only trial that found a significant reduction in overall mortality was the most conservative in terms of number of drugs and dose of drugs allowed. Based on the findings, he suggests a target blood pressure of 150/80 mmHg is more sensible, and says doctors should not be worried if only half of their most elderly patients achieve it. Professor Peter Weissberg, of the British Heart Foundation, said: "Most sensible GPs - which most GPs are - take a pretty cautious view to doling out drugs to old people. "Hypertension is still largely under-treated. By and large, in the UK population, half of people with high blood pressure are not identified."